Last weekend was sunny, but chilly in the morning. We had to scrape the windows. 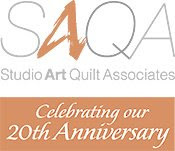 The annual ALCQ quilt show was lovely. The Conoco Phillips Atrium is a beautiful venue. Barbara Lavallee was there signing posters that she did to support our "Teddy Bear Tea". We are celebrating our 10th anniversary in February, & Barbara did a special poster to help raise some funds for the Tea. We had over 60 quilts in the small quilt auction. Here are a few of the quilts in the show. This one was by Sandy Winfree. Bryan came to the show & hammed for my camera. He's growing a beard for the Fur Rondy beard competition this winter. I loved seeing this girl's hair in front of the quilts. This quilter used Shiva Paint sticks. There were several of Carrie Payne's girls around, & here is Carrie. This was the first time I actually got to meet her. I've read her blog, but she attends the night group, & I never get to the night meetings (too tired in the evenings to function). Here is a shot of the last minute bidders just before the bidding closed. Cathy on the right, holding the sheet, bought my crazy quilt. Follow the link below to see the viewers choice quilts. I've been busy working in the studio on my days off. I've finished 2 projects & started a couple more, but can't show them until next month. So much color and creativity! What a great way to spend a weekend! Our show is coming up this weekend. I love the girls hair/quilt! Great picture. Looks like it was a inspiring quilt show, what is in the water up there! Some lovely quilts! I especially like the one by Sandy Winfree. I guess you Alaskans must be busy preparing for winter and for snuggling inside quilting gorgeous quilts while it snows outside!